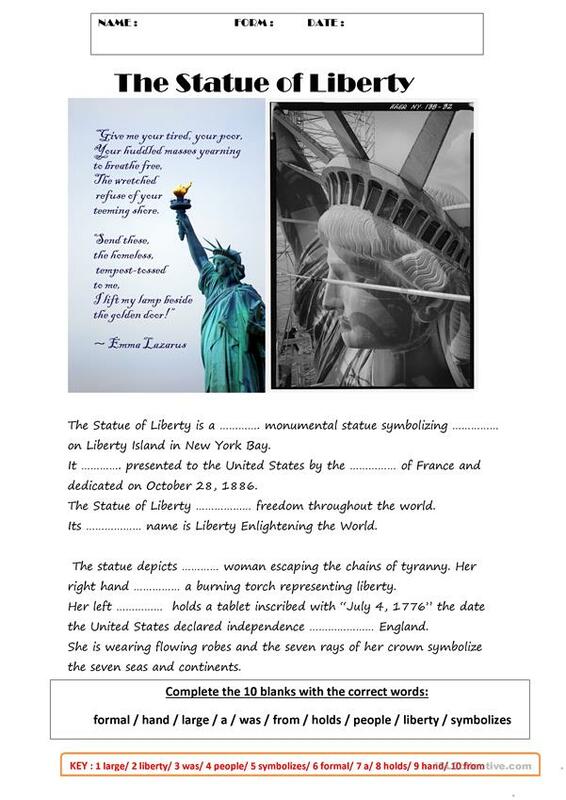 Complete this short presentation about the Statue of Liberty . Key is provided. The above downloadable handout is meant for business/professional students, high school students and adults at Pre-intermediate (A2) level. It is aimed at revising Word order in English, and is useful for developing your groups' Reading and Writing skills. It is focused on the vocabulary topic of American/British English. The answers are provided, too. Veromeda33 is from/lives in France and has been a member of iSLCollective since 2014-11-14 09:58:22. Veromeda33 last logged in on 2019-04-23 14:53:46, and has shared 7 resources on iSLCollective so far.